Members of the Masconomet High School gymnastics team practice at the Yellow Jackets Gymnastics Club. Some teams strive for perfection. Others emphasize winning above all. 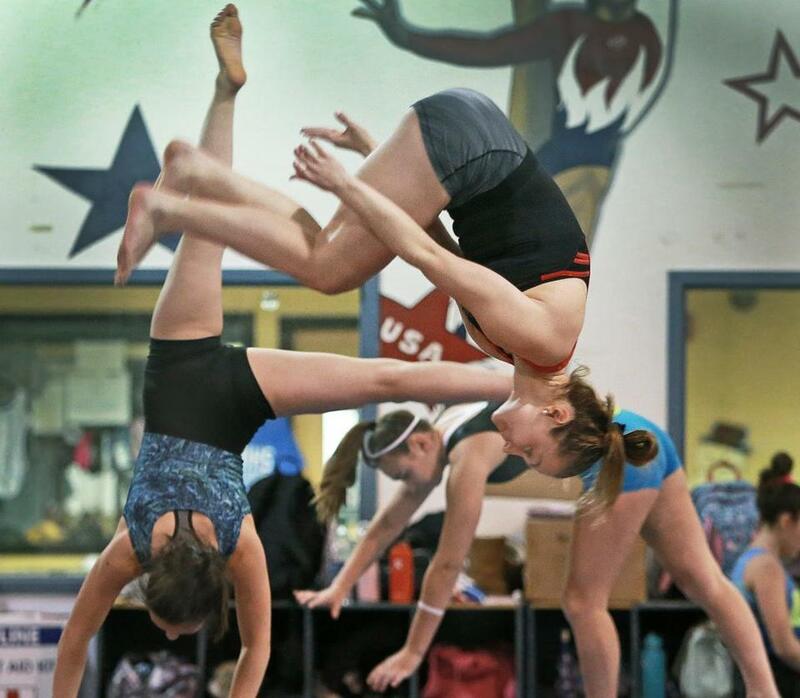 But for the Masconomet girls’ gymnastics team, the only recipe is putting forth one’s best effort and having fun. The team is 3-0 so far and is one of the best programs in the state, with three Level 10 athletes and several others just a notch or two below. Many of the girls participate in competitive gymnastics throughout the year. But it’s not just the talent that makes this group special. It’s character, personality, all of the positive vibes associated with a close-knit team. It’s a Tuesday night at the Yellow Jackets Gymnastics Club in Middleton, the practice location for gymnasts from the Yellow Jackets club, Danvers High School, and Masconomet Regional High School. The Masconomet girls are sectioned off in their corner of the gym. They begin their warm-up, casually jogging around in a circle on the floor, led by Tremblay. Then they sit in a circle, planning their next spirit day. This is not a regular practice, however. Instead of going off into different sections of the gym to hone their routine, the girls convene to watch and score each other. While one gymnast braves the pressure, the others both judge and provide support from below. The girls are divided into groups of three, and each group assigns the gymnast a score. The two coaches score the athlete, too. It’s essentially a mock meet, according to volunteer coach Jana Mowers, whose daughter Gracy is on the team. Yet even as the gymnasts score each other, they provide unwavering support. As Katelyn Aylwin takes to the beam her teammates cheer her on, encouraging her to take a risk. Mowers and head coach Alicia Gomes pay close attention while also offering vocal encouragement. The support rings loud and clear for all Masconomet gymnasts. If an athlete falls, it’s OK; teammates have each other’s backs. If an athlete looks tense, the extra words of wisdom and encouragement work wonders. “We’re always working for the team, we’re doing everything we can to make the team the best, it’s not all about oneself, which makes you cheer each other on,” said Gracy Mowers, a sophomore. The 24-member team includes top gymnasts such as Mowers, Aylwin and her sister, sophomore Sarah Aylwin, freshman Emma Quirk, junior Krya Flak, junior Nicole Bonacorsco, and junior Cat DiNanno. But for this group of girls, there’s a greater focus on the team. The girls have been given that message by Gomes, who has years of experience. The Masconomet coach placed second at states her freshman year at Beverly High School and was named the Boston Globe gymnast of the year. Jana Mowers, who competed at Peabody High School, was also named Boston Globe gymnast of the year. Her husband, Mark, starred on the ice at the University of New Hampshire and later played seven years in the National Hockey League, include the 2006-07 season with the Bruins. To have coaches with such valuable experience makes a difference. The team hosts Danvers on Sunday, Jan. 20, for senior night. Then it competes in three more meets before the postseason competition begins in mid-February. Gomes said the team has the talent to win states, no question. But that’s not her message for the group. “I don’t want them to go out and compete afraid to mess up, I want them to enjoy what they’re doing,” Gomes said. Alex Bensley can reached at alex.bensley@globe.com.